Now when there is already some content, it's time to announce planet phpMyAdmin. You will find there posts from phpMyAdmin contributors including Google Summer of Code students, so you might find there what interesting ideas they have. Please note that this blog does not have to contain only phpMyAdmin related posts, it's just for all what contributors do (as usual on other planets). It currently lives on http://pmaplanet.cihar.com/. PS: If you think your blog is missing there, please drop me a note. Published on April 29, 2009, 2:37 p.m. Mobile phones synchronisation for OpenSUSE. This will hopefully bring improvements to both Gammu and Conduit and the outcome should be working solution for at least some phones. Import improvements for phpMyAdmin. I would say this has been the best GSoC proposal I have seen so far, so let's see how it will progress. Changes tracking in phpMyAdmin. At the end we do have two projects on similar topic, but I want to push one of students more to synchronisation direction. Let's see what will this bring to participating projects, but I hope all projects will end up at least with partial success and will bring great additions to free software. Published on April 22, 2009, 11:38 p.m. Looking at student proposals for phpMyAdmin, we have at least five for improving import functionality in same way. It's good to have a choice, but if you are thinking about filing another proposal for import, I have to say it is really not a good idea, because we simply have too much of them already. PS: Student checklist can help you to increase your chance being the chosen one ;-). Published on April 1, 2009, 9:58 a.m.
Today I finally spend few minutes and installed OpenID extension into Mediawiki which runs phpMyAdmin wiki. The installation was quite straightforward, I only had to debug SimpleID a bit while testing the setup, because I was hit by one long known bug. But it should work for now and feel free to use OpenID on our wiki! Published on March 25, 2009, 4:14 p.m.
Today we finally got to setup official URLs for phpMyAdmin wiki - http://wiki.phpmyadmin.net/ and demo server - http://demo.phpmyadmin.net/. Now I should find time to match demo server look and feel with rest of phpmyadmin.net website, just make people feel they are still on our official pages. Update: http://demo.phpmyadmin.net/ layout now matches http://www.phpmyadmin.net/! Published on March 24, 2009, 1:44 p.m.
Do you have free time in summer? Are you student? It's great chance to improve some free software through Google Summer of Code! 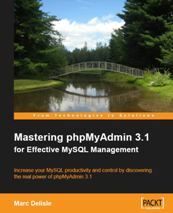 This year (same as year ago), phpMyAdmin is not direct participant, however nice folks at MySQL offered us cooperation. That means that you can submit our ideas to a MySQL project and we will pick up few of them. So go ahead and submit your applications, you have time till 3rd April! Published on March 21, 2009, 8:39 a.m.
After quite successful debut in Google Summer of Code last year (even not directly, but though MySQL project), where both projects ended quite successfully and brought great addition to our code base, it's time to try to get again on the track. Hopefully we will manage to be direct participants this year. If you have some great ideas which are missing in phpMyAdmin, feel free to fill them either in feature tracker or directly into our ideas page. Published on March 3, 2009, 10:48 a.m. Okay, I'm again not ready for release on Friday, so I will probably switch to Monday releases ;-). But I think it's good to announce some news which you can expect in next Gammu version. Besides usual bunch of bug fixes (many of them were revealed by testing with Valgrind) the new testing version will have few interesting features. For Nokia users on Linux is great news, that Gammu can now use directly FBUS USB interface (through libusb-1.0. This is especially good news for DKU-2 cable owners, as before they did not have possibility to use Gammu without compiling separate (and broken) module. This connection type is called fbususb and is heavily inspired by implementation in Gnokii, but uses newer libusb API and behaves more nicely when CDC ACM driver has already hooked some interfaces. I would specially like to thank to Peter Stuge for testing this feature (I'm still without a Nokia cable). The second big news is monitoring of SMSD state. SMSD now exports shared memory segment, where some information about it's runtime can be found. Little program called gammu-smsd-monitor can display you these information. The third update is for python-gammu users, which now gain ability to interact with SMSD through new gammu.SMSD object. For now it can inject SMSD messages and get SMSD status (see previous paragraph), but more features can come in future. I want to use this for creating some GUI for SMSD, which will allow to send messages and monitor it's state. But this is still future and if you want to write something like this, you're welcome! Published on Jan. 30, 2009, 6:34 p.m.